A new take on analogue chorus that rewards exploration. Adjustable dry blend offers many options between dry, chorus and vibrato. Lag knob to vary the richness. Some could argue that Roland had got it just right in the first place with its analogue Boss CE-1 chorus/vibrato and CE-2 chorus pedals way back when, but that’s never stopped other companies continuing to produce pedals in the genre. If you’re going to do it, though, it’s worthwhile bringing something completely new to the table, widening the available sonic palette and providing more than just the ubiquitous rate and depth knobs. And Walrus Audio has done just that with its Julia Chorus and Vibrato pedal. A fully analogue pedal, it builds on the fact that good chorus depends on a blend of dry sound and modulated sound, and that vibrato is the modulated signal with no dry sound present. This leads to the pedal’s ‘D-C-V’ (Dry-Chorus- Vibrato) blend knob that changes the ratio of dry and wet (modulated) sound. It starts off with a fully dry sound and offers a 50/50 blend for a typical chorus at its midway setting, culminating in a totally wet vibrato at its extreme travel. Obviously, there are a whole range of subtleties that can be explored along that arc, should you wish. Besides this, there’s also a Lag knob, which determines the centre delay time that the LFO modulates from, plus you also get a choice of sine or triangle LFO waveforms. Add in those Rate and Depth knobs and you have plenty to dial in, including some modulation choices that fall between the cracks of what other pedals can provide. 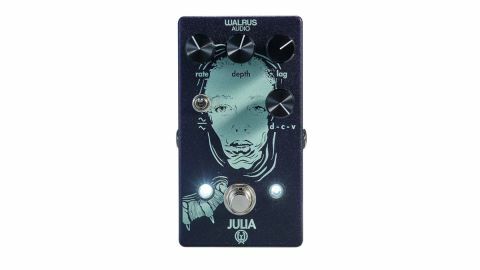 A purely mono pedal, the Julia is a fairly standard size and runs on nine-volt power but has no battery option. It features two LEDs, one each side of the footswitch. To the left you get the standard bypass indication, while the LED to the right flashes in time to the LFO speed, providing a visual clue on a darkened stage. The knobs have integral white lines to show their position clearly, but the front panel artwork (presumably inspired by Creature From The Black Lagoon, starring Julie Adams) means there are both light and dark colours around these knobs, which makes it more difficult for anyone wanting to mark settings with a Chinagraph... although it’s nothing that judicious use of masking tape couldn’t sort. Initial impressions of the Julia are of a well-rounded tone, warm in the midrange with no frequencies obviously missing or prominent, and a slight volume boost. Starting out on a straightforward chorus sound - with the Rate and Depth knobs set around the midway position, Blend knob set around 11 o’clock and the Lag knob at its minimum position - gives a familiar, classic 1980s-style pedal chorus, bringing an animated dimension to the sound. A triangle waveform is standard for chorus pedals, but switching to sine offers a subtly different flavour - the differences between the two waves being more marked on a fast vibrato setting where a softer warble becomes more sharply on/ off with a triangle setting. Turning up the Lag knob offers the most obvious effect on the overall sound as the pitch-shift gets wider; the sound can be described as ‘swimmier’ as it seems to add a sense of more voices within the chorus. It’s with elements of this larger choral sound that you can conjure up various rotary speaker effects. All this depends, though, on where the dry blend is set, because it works closely in conjunction with the other knobs to dial in useful hybrid modulations, as well as chorus and vibrato tones. If you’d like chorus and vibrato for your pedalboard but don’t want to go the route of the do-it-all multiple modulation pedal, there are single pedals out there that will give you both: the Boss CE-2W Waza, for example. However, where that pedal lets you switch between chorus and vibrato modes, the Julia offers more in the way of nuance by covering the murky waters between the two - anything from a tickle of something that lets you know you’re not listening to purely dry sound, to nausea-inducing vibrato where good taste (arguably) goes out of the window. Preset lovers may not be keen on the purely analogue operation, which means that you have to physically dial in the sound, but it’s in that creative juxtaposition of knobs that the magic lies.